[M]ortgages were acknowledged to be the most mathematically complex securities in the marketplace. The complexity arose entirely out of the option the homeowner has to prepay his loan; it was poetic that the single financial complexity contributed to the marketplace by the common man was the Gordian knot giving the best brains on Wall Street a run for their money. Ranieri’s instincts that had led him to build an enormous research department had been right: Mortgages were about math. The money was made, therefore, with ever more refined tools of analysis. The so-called government-sponsored enterprises went through a nearly $200 billion government bailout during the financial crisis, motivated in large part by losses on loans that they guaranteed, so I figured there must be something interesting in the loan-level data. 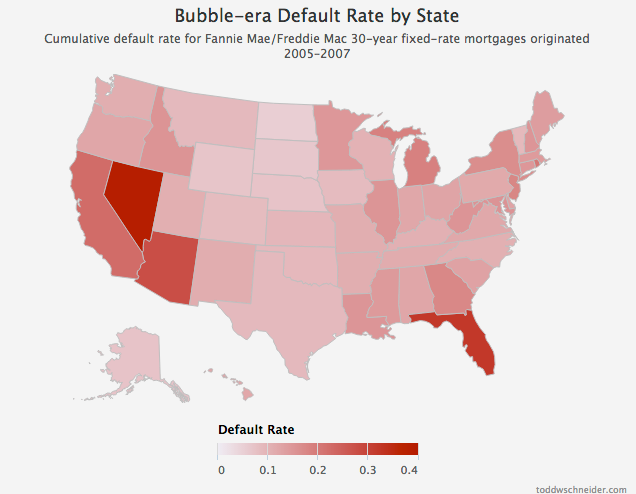 I decided to dig in with some geographic analysis, an attempt to identify the loan-level characteristics most predictive of default rates, and more. As part of my efforts, I wrote code to transform the raw data into a more useful PostgreSQL database format, and some R scripts for analysis. The code for processing and analyzing the data is all available on GitHub. It should not be overlooked that in the not-so-distant past, i.e. when I worked as a mortgage analyst, an analysis of loan-level mortgage data would have cost a lot of money. Between licensing data and paying for expensive computers to analyze it, you could have easily incurred costs north of a million dollars per year. Today, in addition to Fannie and Freddie making their data freely available, we’re in the midst of what I might call the “medium data” revolution: personal computers are so powerful that my MacBook Air is capable of analyzing the entire 215 GB of data, representing some 38 million loans, 1.6 billion observations, and over $7.1 trillion of origination volume. Furthermore, I did everything with free, open-source software. I chose PostgreSQL and R, but there are plenty of other free options you could choose for storage and analysis. Both agencies released data for 30-year, fully amortizing, fixed-rate mortgages, which are considered standard in the U.S. mortgage market. Each loan has some static characteristics which never change for the life of the loan, e.g. geographic information, the amount of the loan, and a few dozen others. Each loan also has a series of monthly observations, with values that can change from one month to the next, e.g. the loan’s balance, its delinquency status, and whether it prepaid in full. The PostgreSQL schema then is split into 2 main tables, called loans and monthly_observations. 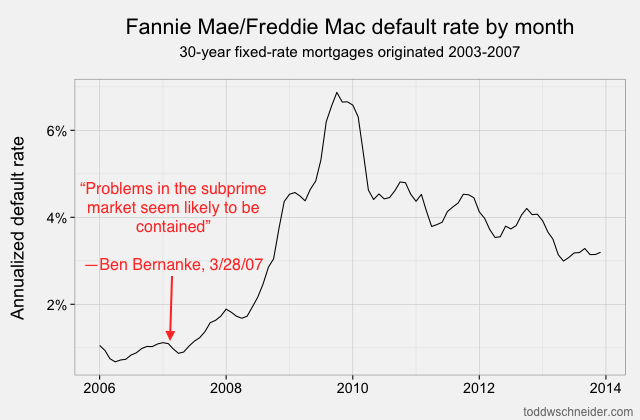 Beyond the data provided by Fannie and Freddie, I also found it helpful to pull in some external data sources, most notably the FHFA’s home price indexes and Freddie Mac’s mortgage rate survey data. A fuller glossary of the data is available in an appendix at the bottom of this post. 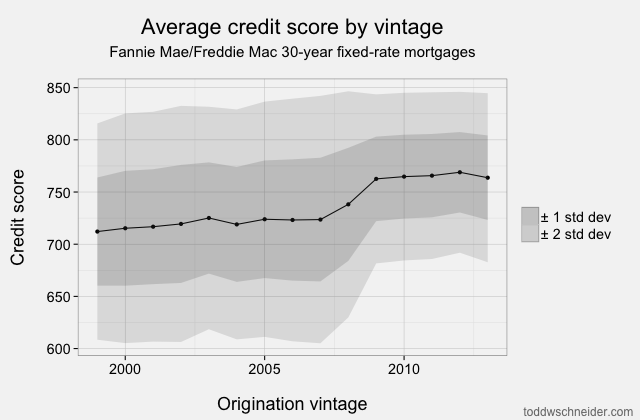 What can we learn from the loan-level data? I started by calculating simple cumulative default rates for each origination year, defining a “defaulted” loan as one that became at least 60 days delinquent at some point in its life. Note that not all 60+ day delinquent loans actually turn into foreclosures where the borrower has to leave the house, but missing at least 2 payments typically indicates a serious level of distress. About 4% of loans originated from 1999 to 2003 became seriously delinquent at some point in their lives. The 2004 vintage showed some performance deterioration, and then the vintages from 2005 through 2008 show significantly worse performance: more than 15% of all loans originated in those years became distressed. From 2009 through present, the performance has been much better, with fewer than 2% of loans defaulting. 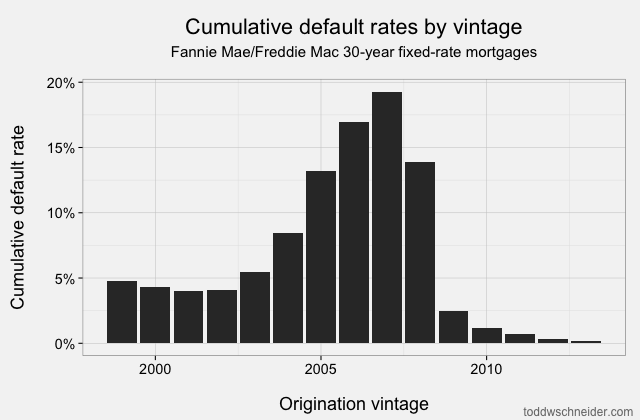 Of course part of that is that it takes time for a loan to default, so the most recent vintages will tend to have lower cumulative default rates while their loans are still young. But as we’ll see later, there was also a dramatic shift in lending standards so that the loans made since 2009 have been much higher credit quality. 4 states in particular jump out as the worst performers: California, Florida, Arizona, and Nevada. 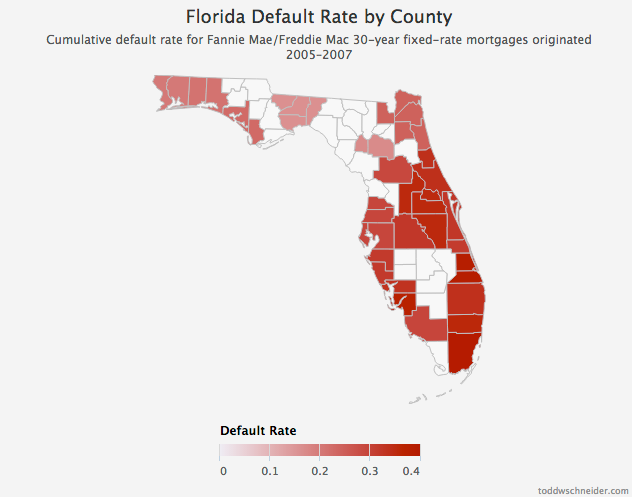 Just about every state experienced significantly higher than normal default rates during the mortgage crisis, but these 4 states, often labeled the “sand states”, experienced the worst of it. I also used the data to make more specific maps at the county-level; default rates within different metropolitan areas can show quite a bit of variation. 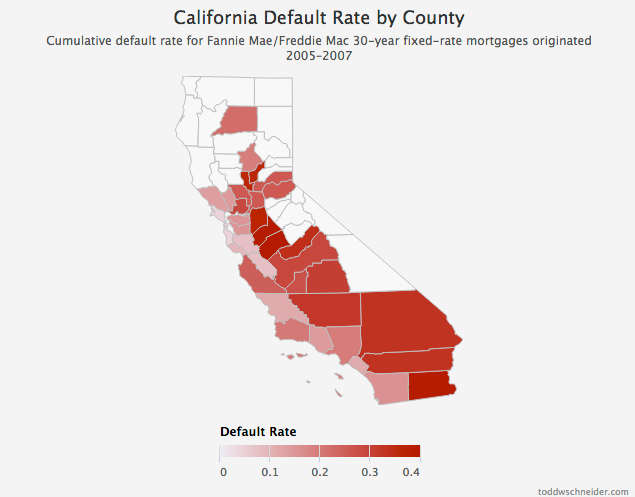 California jumps out as having the most interesting map: the highest default rates in California came from inland counties, most notably in the Central Valley and Inland Empire regions. These exurban areas, like Stockton, Modesto, and Riverside, experienced the largest increases in home prices leading up to the crisis, and subsequently the largest collapses. The inland cities, with more land available to allow expansion, experienced the most overbuilding, the most aggressive lenders, the highest levels of speculators looking to get rich quick by flipping houses, and so perhaps it’s not that surprising that when the housing market turned south, they also experienced the highest default rates. Not coincidentally, California has also led the nation in “housing bubble” searches on Google Trends every year since 2004. Arizona and Nevada have very few counties, so their maps don’t look very interesting, and each state is dominated by a single metropolitan area: Phoenix experienced a 31% cumulative default rate, and Las Vegas a 42% cumulative default rate. The dataset includes lots of variables for each individual loan beyond geographic location, and many of these variables seem like they should correlate to mortgage performance. Perhaps most obviously, credit scores were developed specifically for the purpose of assessing default risk, so it would be awfully surprising if credit scores weren’t correlated to default rates. Some of the additional variables include the amount of the loan, the interest rate, the loan-to-value ratio (LTV), debt-to-income ratio (DTI), the purpose of the loan (purchase, refinance), the type of property, and whether the loan was originated directly by a lender or by a third party. All of these things seem like they might have some predictive value for modeling default rates. We can also combine loan data with other data sources to calculate additional variables. In particular, we can use the FHFA’s home price data to calculate current loan-to-value ratios for every loan in the dataset. For example, say a loan started at an 80 LTV, but the home’s value has since declined by 25%. If the balance on the loan has remained unchanged, then the new current LTV would be 0.8 / (1 - 0.25) = 106.7. An LTV over 100 means the borrower is “underwater” – the value of the house is now less than the amount owed on the loan. If the borrower does not believe that home prices will recover for a long time, the borrower might rationally decide to “walk away” from the loan. Another calculated variable is called spread at origination (SATO), which is the difference between the loan’s interest rate, and the prevailing market rate at the time of origination. Typically borrowers with weaker credit get higher rates, so we’d expect a larger value of SATO to correlate to higher default rates. Even before formulating any specific model, I find it helpful to look at graphs of aggregated data. I took every monthly observation from 2009-11, bucketed along several dimensions, and calculated default rates. Note that we’re now looking at transition rates from current to defaulted, as opposed to the cumulative default rates in the previous section. Transition rates are a more natural quantity to model, since when we make future projections we have to predict not only how many loans will default, but when they’ll default. Clearly both of these variables are highly correlated with default rates, and in the directions we would expect: higher credit scores correlate to lower default rates, and higher loan-to-value ratios correlate to higher default rates. The dataset cannot tell us why any borrowers defaulted. Some probably came upon financial hardship due to the economic recession and were unable to pay their bills. Others might have been taken advantage of by unscrupulous mortgage brokers, and could never afford their monthly payments. And, yes, some also “strategically” defaulted – meaning they could have paid their mortgages, but chose not to. The fact that current LTV is so highly correlated to default rates leads me to suspect that strategic defaults were fairly common in the depths of the recession. But why might some people walk away from loans that they’re capable of paying? As an example, say a borrower has a $300,000 loan at a 6% interest rate against a home that had since declined in value to $200,000, for an LTV of 150. The monthly payment on such a mortgage is $1,800. Assuming a price/rent ratio of 18, approximately the national average, then the borrower could rent a similar home for $925 per month, a savings of over $10,000 per year. Of course strategically defaulting would greatly damage the borrower’s credit, making it potentially much more difficult to get new loans in the future, but for such a large monthly savings, the borrower might reasonably decide not to pay. The categorical variables, loan_purpose and channel, are the easiest to interpret because we can just look at the exp(coef) column to see their effect. In the case of loan_purpose, loans that were made for refinances multiply the default rate by 1.593 compared to loans that were made for purchases. For channel, loans that were made by third party originators, e.g. mortgage brokers, increase the hazard rate by 17% compared to loans that were originated directly by lenders. Remember that the y-axis here shows a multiplier of the base default rate, not the default rate itself. So, for example, the average current LTV in the dataset is 82, which has a multiplier of 1. If we were looking at two loans, one of which had current LTV 82, the other a current LTV of 125, then the model predicts that the latter loan’s monthly default rate is 2.65 times the default rate of the former. All of the variables behave directionally as we’d expect: higher LTV, DTI, and SATO are all associated with higher hazard rates, while higher credit scores are associated with lower hazard rates. 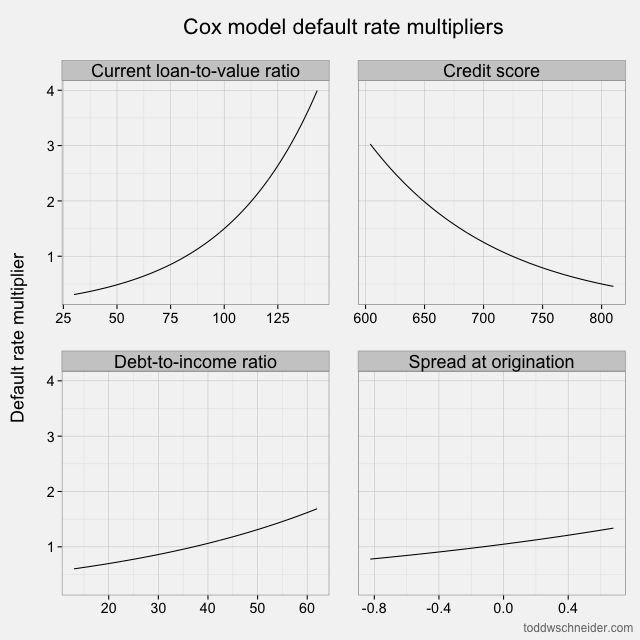 The graph of hazard rate multipliers shows that current LTV and credit score have larger magnitude impact on defaults than DTI and SATO. 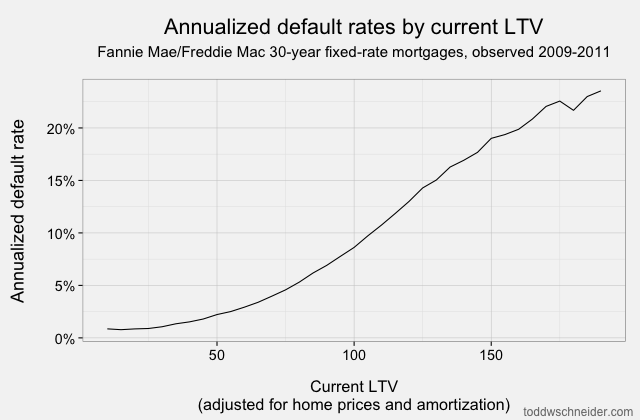 Again the model tells us nothing about why borrowers default, but it does suggest that home price-adjusted LTVs and credit scores are the most important predictors of default rates. There is plenty of opportunity to develop more advanced default models. Many techniques, including Cox proportional hazards models and logistic regression, are popular because they have relatively simple functional forms that behave well mathematically, and there are existing software packages that make it easy to calibrate parameters. On the other hand, these models can fall short because they have no meaningful connection to the actual underlying dynamics of mortgage borrowers. So-called agent-based models attempt to model the behavior of individual borrowers at the micro-level, then simulate many agents interacting and making individual decisions, before aggregating into a final prediction. The agent-based approach can be computationally much more complicated, but at least in my opinion it seems like a model based on traditional statistical techniques will never explain phenomena like the housing bubble and financial crisis, whereas a well-formulated agent-based model at least has a fighting chance. Why are defaults so much lower today? We saw earlier that recently originated loans have defaulted at a much lower rate than loans originated during the bubble years. For one thing, home prices bottomed out sometime around 2012 and have rebounded some since then. The partial home price recovery causes current LTVs to decline, which as we’ve seen already, should correlate to lower default rates. Perhaps more importantly, though, it appears that Fannie and Freddie have adopted significantly stricter lending standards starting in 2009. The average FICO score used to be 720, but since 2009 it has been more like 765. 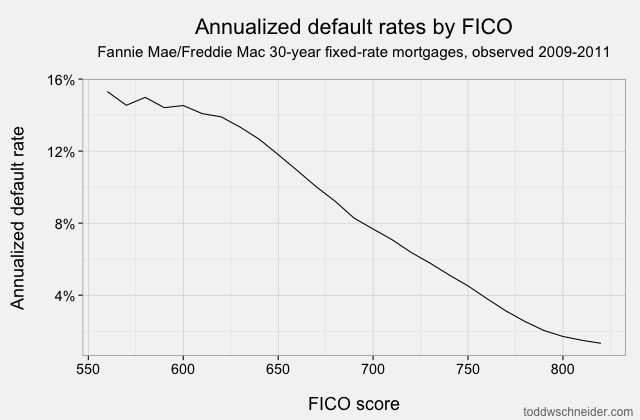 Furthermore, if we look 2 standard deviations from the mean, we see that the low end of the FICO spectrum used to reach down to about 600, but since 2009 there have been very few loans with FICO less than 680. Tighter agency standards, coupled with a complete shutdown in the non-agency mortgage market, including both subprime and Alt-A lending, mean that there is very little credit available to borrowers with low credit scores (a far more difficult question is whether this is a good or bad thing!). There are many more things we could study in the dataset. Long before investors worried about default rates on agency mortgages, they worried about voluntary prepayments due to refinancing and housing turnover. When interest rates go down, many mortgage borrowers refinance their loans to lower their monthly payments. For mortgage investors, investment returns can depend heavily on how well they project prepayments. I’m sure some astronomical number of human-hours have been spent modeling prepayments, dating back to the 1970s when mortgage securitization started to become a big industry. Historically the models were calibrated against aggregated pool-level data, which was okay, but does not offer as much potential as loan-level data. With more loan-level data available, and faster computers to process it, I’d imagine that many on Wall Street are already hard at work using this relatively new data to refine their prepayment models. Fannie and Freddie continue to improve their datasets, recently adding data for actual losses suffered on defaulted loans. In other words, when the bank has to foreclose and sell a house, how much money do the agencies typically lose? This loss severity number is itself a function of many variables, including home prices, maintenance costs, legal costs, and others. Severity will also be extremely important for mortgage investors in the proposed new world where Fannie and Freddie might no longer provide full guarantees against loss of principal. Beyond Wall Street, I’d hope that the open-source nature of the data helps provide a better “early detection” system than we saw in the most recent crisis. A lot of people were probably generally aware that the mortgage market was in trouble as early as 2007, but unless you had access to specialized data and systems to analyze it, there was no way for most people to really know what was going on. There’s still room for improvement: Fannie and Freddie could expand their datasets to include more than just 30-year fixed-rate loans. There are plenty of other types of loans, including 15-year terms and loans with adjustable interest rates. 30-year fixed-rate loans continue to be the standard of the U.S. mortgage market, but it would still be good to release data for all of Fannie and Freddie’s loans. It’d also be nice if Fannie and Freddie released the data in a more timely manner instead of lagged by several months to a year. The lag before releasing the data reduces its effectiveness as a tool for monitoring the general health of the economy, but again it’s much better than only a few years ago when there was no readily available data at all. In the end, the trend toward free and open data, combined with the ever-increasing availability of computing power, will hopefully provide a clearer picture of the mortgage market, and possibly even prevent another financial crisis. Each loan has an origination record, which includes static data that will never change for the life of the loan. Each loan also has a set of monthly observations, which record values at every month of the loan’s life. The PostgreSQL database has 2 main tables: loans and monthly_observations. Beyond the data provided by Fannie and Freddie, I found it helpful to add columns to the loans table for what we might call calculated characteristics. For example, I found that it was helpful to have a column on the loans table called first_serious_dq_date. This column would be populated with the first month in which a loan was 60 days delinquent, or null if the loan has never been 60 days delinquent. There’s no new information added by the column, but it’s convenient to have it available in the loans table as opposed to the monthly_observations table because loans is a significantly smaller table, and so if we can avoid database joins to monthly_observations for some analysis then that makes things faster and easier.